I took a mini-vacation to the Oregon Coast and visited one of Oregon's true gems, Cape Perpetua. When I visited, it was pouring rain and I got truly soaked. 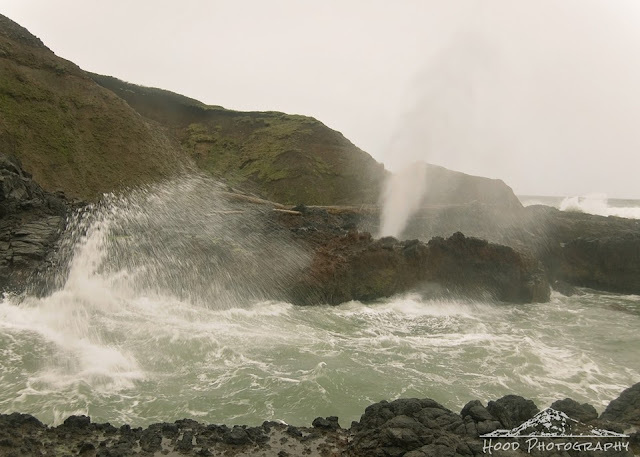 But I did manage to make my way down to witness Spouting Horn at high tide. This photo was taken about 45 minutes before the peak of high tide, and even then the waves were getting high enough to splash over the rock walls of Cook's Chasm where I was standing. Each time a huge wave would hit the chasm, an eruption of sound would occur, and water would shoot high in the air out of the blowhole. It was so awesome to witness in the stormy conditions! Looks like a whale is hiding behind the rock. Great photo. Quite a wild looking spot! How cool! I'd love to see one of those one day! Wow! What an awesome photo! Definitely worth getting soaked. Hope the rest of your trip was just as spectacular but a lot drier.